If it has been a while since you've been diving the PADI Scuba Review is made for you. You start with PADI's Scuba Tune Up workbook which you can pick up when you register for the class. This is a great review of basic scuba knowledge including dive tables (and the other skills that get a little rusty). The PADI Scuba Review class starts with a classroom session reviewing the PADI Scuba Tune Up workbook and answering questions you may have. We'll also go over changes in dive techniques and equipment since your certification. We follow the class session with a pool session the same night, where we review the basic scuba skills. The PADI Scuba Review is a great confidence builder before a tropical dive trip or local diving adventure. Don't forget to bring Mask, Fins, and Snorkel along with a swimsuit and towel to class. 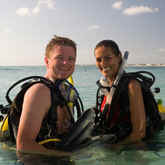 Cost $69.95 - includes PADI Scuba Tune Up Workbook, pool fees, and use of scuba equipment. Complete the PADI Scuba Tune Up Workbook. You also need to complete a PADI Student Record File (which includes a Medical Statement). If you answer yes to any of the medical history questions, the PADI Medical Statement must be signed by your physician prior to your pool session. You can download and review the PADI Medical Statement here. If you require a physicians approval, we recommend you also retaining an extra copy of the signed Medical Statement for your records. PADI Scuba Tune-Up Workbook is included in course fee, and is yours to keep.